I am back and way cooler.. 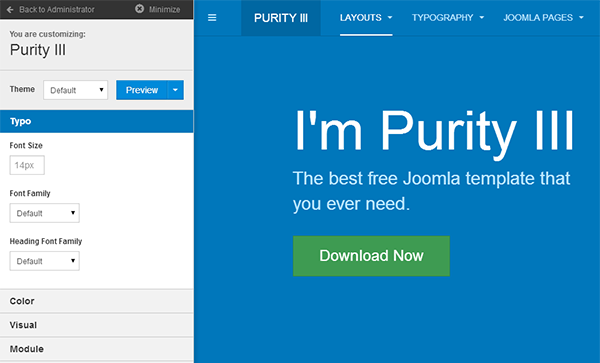 Therefore, I decided that it is the time we brought back the spirit of Purity into JoomlArt. The first mock of Purity was crafted way back in the late of October 2013. 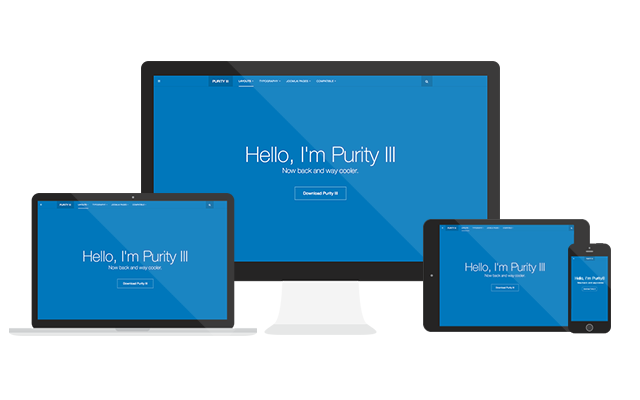 And after 3 months of hard work, today I officially announce the availability of the first version (Developer Preview) of our featured project in 2013: Purity III - The best free template in the world for Joomla 3.x. We claim it to be the Best Free Joomla template, if you are not convinced by the end of this introductory blog post, let us know in the comment section below. Why Purity III is the best? Please note this is just a introductory post, more detailed blog posts would be coming up soon. Comes with 7 beautiful new layouts apart from 6 classic layouts, Purity III has everything you would ever need. It can easily be transformed to a Magazine Joomla template with its Magazine layout, a dynamic Joomla template for Business with Corporate layout, a Joomla template for Blogging with Blog layout, a Joomla template for Showcasing with Portfolio layout, a Joomla template for featuring your favorite products using Feature Intro 1 or 2, a Joomla template for Glossary or you can stick with the classic Joomla layout and start tweaking. 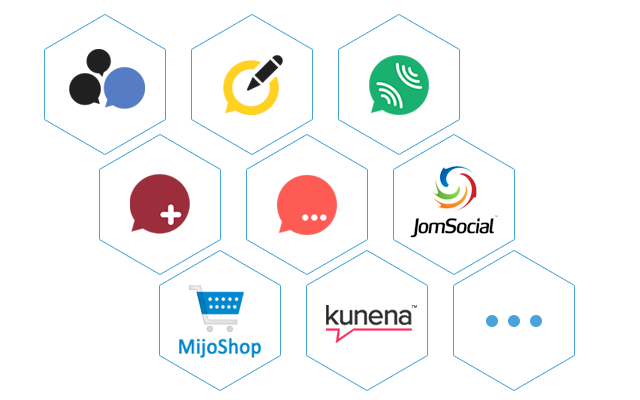 We have focussed equally on the 3rd party extension support in the Purity III, it works seamlessly with most of the popular 3rd party Joomla extensions, such as: JomSocial, Kunena, EasySocial, Mijoshop, etc and we are working on to extend the number of 3rd party extensions support in Purity III. This will be an on-going project that we are committed to for Purity III. If your favorite extension seems to be missing from this list, let us know in the comments. Purity III is specially styled with beautiful and versatile typography accompanied by 3 worth-to-die-for bonus pages hands-down. 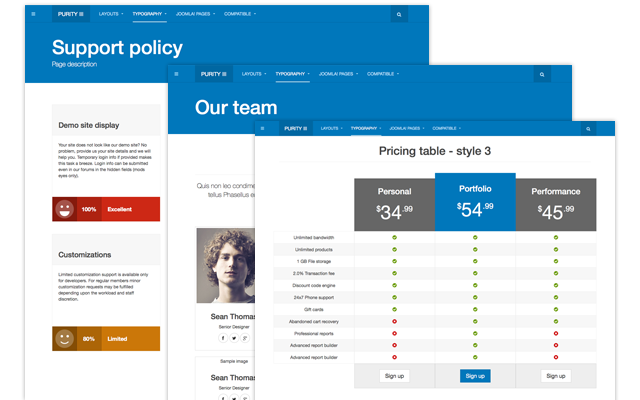 These are Our team, Pricing table and Support policy page. We ourselves would be using it for our own site soon. T3 Framework - a truly powerful Joomla template framework makes all the impossibilities in Purity III all possible. 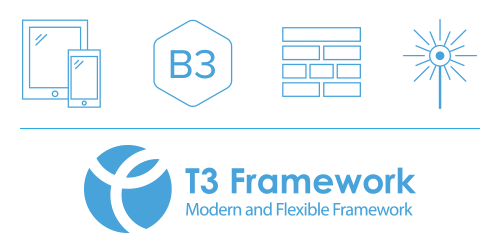 Empowered with Bootstrap 3 at heart, T3 Framework assures a sleek and intuitive framework in both front-end and back-end for a fuss-free web development. 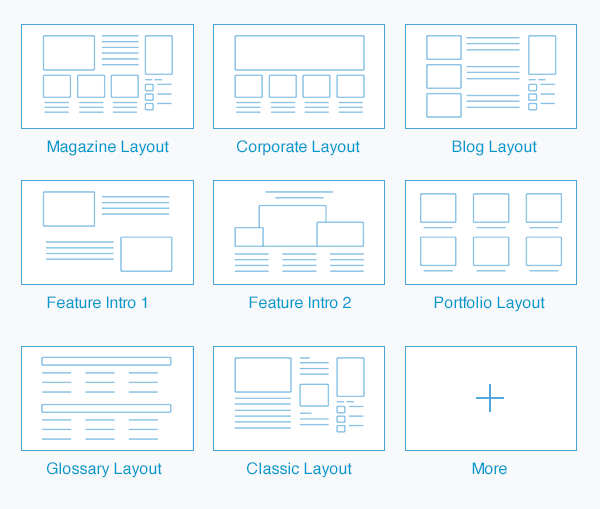 The latest T3 Framework version allows us to easily create new content types, define them, and designing their layouts. This has been implemented in Purity III project and brings tremendously huge benefits and unexpectedly fun features to the template development experience. The insights on how to do it and what did we do to make it happen will be covered in the upcoming blogpost (so stay calm and keep tuned in). 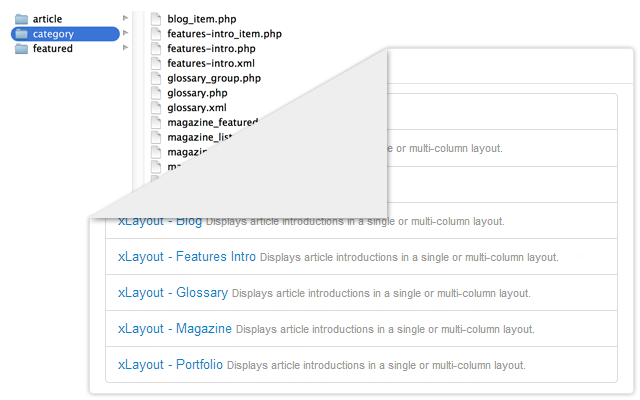 From this version onward, T3 Framework and Purity III allows you to load the extra style files for specific menu items. This comes in handy for the integration for the 3rd party Joomla extensions as well as having different layout styles on your site. That doesn't mean that you could not achieve it in the past, it merely means T3 Framework now makes it easier, quickier and absolutely more convenient. ThemeMagic tool gives you the freedom to customize your template and be able to see how those changes affect the front-end simultaneously, eliminating the process of diving too deep into the code. Not an exception, ThemeMagic in Purity III will allow you to achieve the same. Customize modules background, text, title text and title background colors, or typo in general from font size to font type, color and other settings. Purity III has various type of layouts, each comes with its own structure. 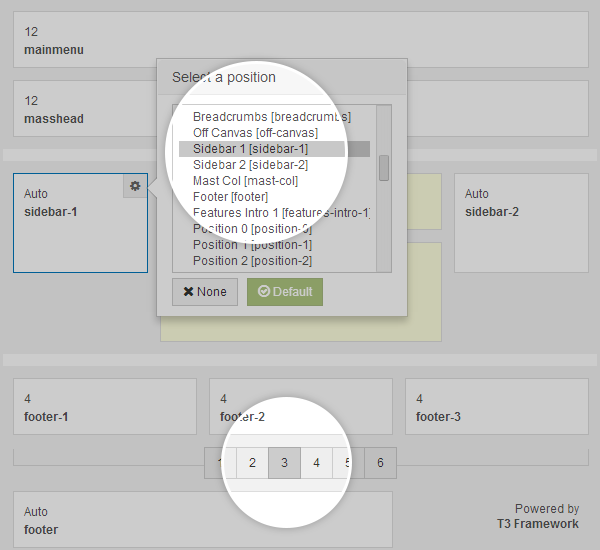 Thanks to T3 Framework, it can be easily adjusted, configured accordingly to your project. Assigning module position, replacing one module to another, increasing/decreasing number of modules position in spotlight block, and dragging to resize a module position can be done right off the batch for not only for desktop layout, but also for responsive layouts on mobile and tablets devices as well. 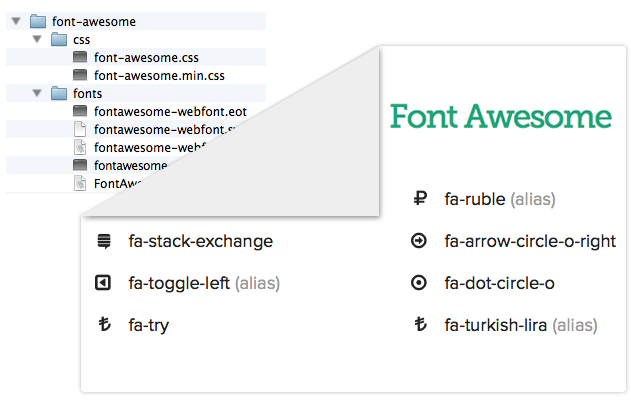 T3 Framework supports the latest version of Font Awesome 4, which gives Purity III the power of featuring all the good stuffs in it including: iconic fonts, from size, color, to other cool appearance, etc. This is just the beginning of Purity III and there will be more blog posts coming up with details on every amazing feature. Purity III will be available for FREE to everyone once it goes stable, for now you can play around with its beta version and see Purity III in action. To unlock this feature, give a shoutout to your friends via Facebook, G+ or Twitter. Any comments or suggestion for Purity III, just drop us a line in the comment section below. All feedback are highly appreciated. We know you expect a club template every month. JA Purity III is a club template for the month February 2014 but it is also free for everyone. But the club members get bonus access to JA Wall joomla template bundle for free. Read details in this forum thread.